When the Todd Bolender Center for Dance & Creativity opened in August 2011, it received rave reviews for its beauty (and brawn). Beyond the beauty of the space and the important act of saving a treasured architectural relic, the Bolender Center has greatly improved the quality of life for the dance troops who inhabit the space, by providing proper rehearsal spaces so the program can expand in proportion to the enormous support of the Kansas City community. 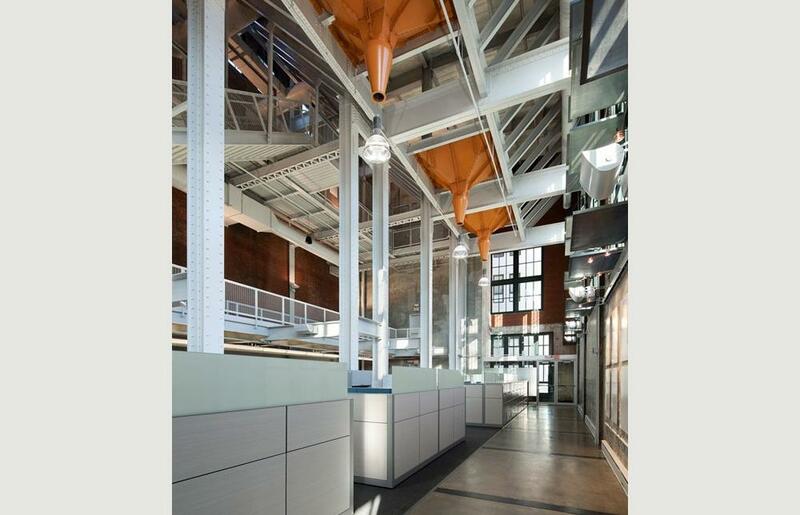 The reality is that “energy” is very much a part of this building’s story. There is a strong relationship between the present use of the historic building and it’s past, in dynamic contrast and, serendipitously, in parallel, the original use for the building was as a Power House. It was employed burning coal in order to generate steam and electricity to power Union Station, the surrounding rail yards and buildings. This Jarvis Hunt-designed building was completed in 1914 at the same time as Union Station, but later abandoned in the 1970s. The decaying building had daunting structural deterioration and drainage issues. However, amid the decay, there were many innovative design features that inspired a holistic adaptive reuse, such as the “Texas skylights”, which are raised portions of roof with operable glass windows that can be opened to release portions of roof with operable glass windows that can be opened to release heat and allow natural sunlight to come in. As constant advocates for true sustainability through the adaptive reuse of our urban buildings, BNIM welcomed the challenge of creating an organized program diagram within an existing historical building and finding innovative and creative uses for existing structures and interior elements in new applications. The raw spaces mix with deliately interwoven architectural elements in a okay off of the mechanic of dance itself. The design team worked diligently to breath life back into a structure that was running out of time, as many decades of decay had taken their toll. The expansive space left behind armatures on which to hang the future of dance. 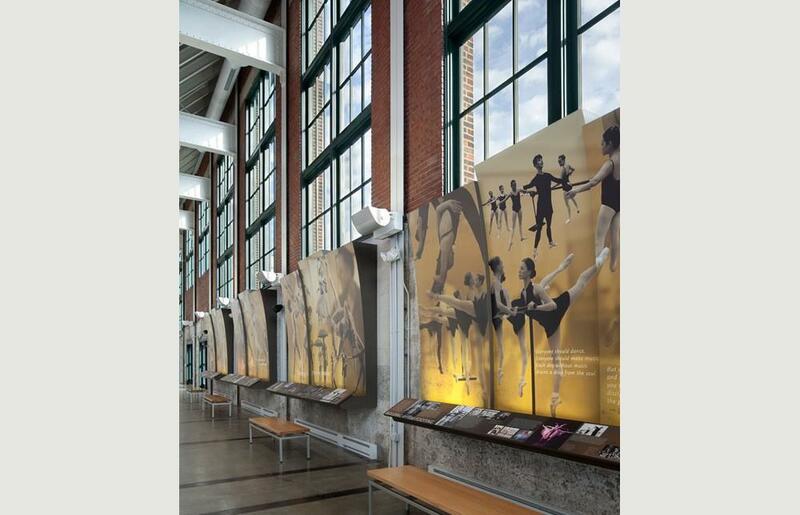 Each intervention and adaptation was carefully planned and executed, resulting in a perfect fit for the Kansas City Ballet for generations to come. 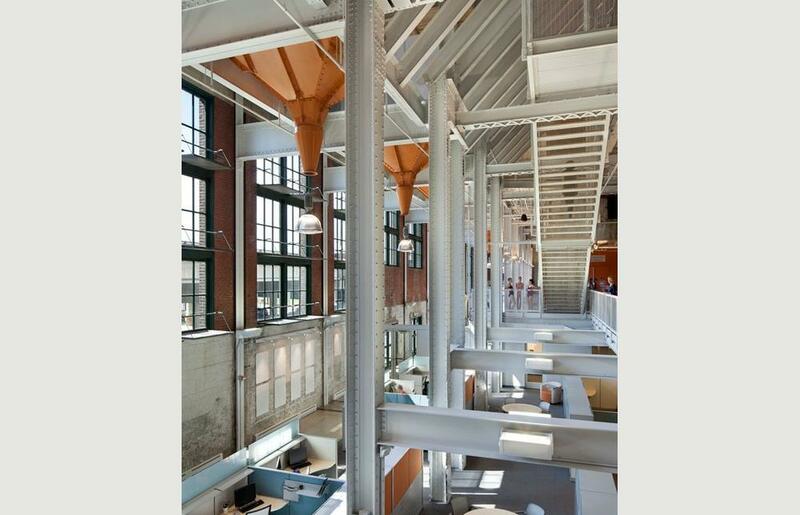 The studio requirements for daylight, height, and column free volumes were accommodated in the former North Engine Room. It is brought to life by the reconstruction of the Texas Skylight and a new “floating” studio floor plate within the volume, which borrows light from the exterior windows. The restored windows, readapted with new sustainable acoya wood sashes and insulated glazing systems, provide an energy efficient assembly while silencing adjacent train noise. A gantry crane, a remnant left over from days of moving heavy equipment, is parked in its final resting place looking down over the new Studio Theater, which has a floor area that exactly matched the performance stage dimensions. 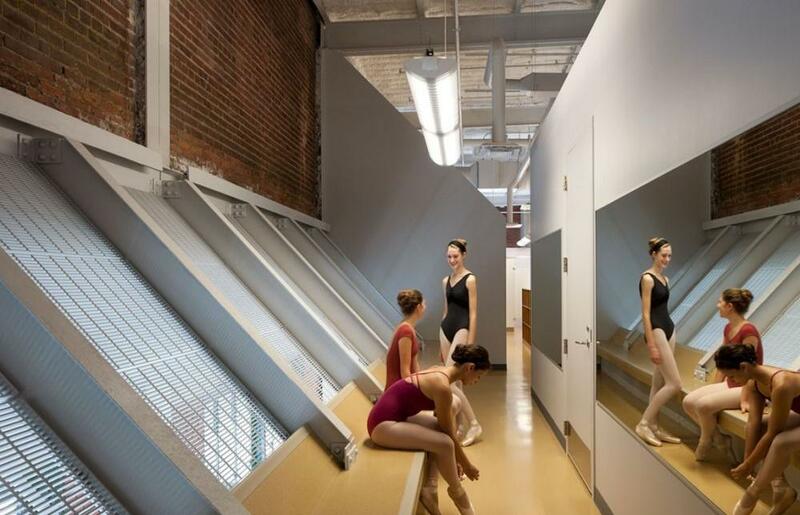 Visual “portals” into the space allow even the youngest pupils to admire – and be inspired – by observing the Kansas City Ballet, are at home in the brawny riveted interior. 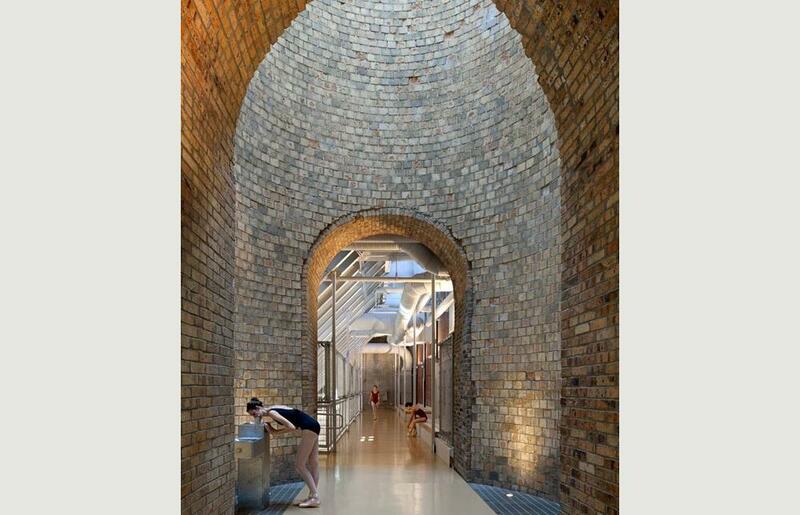 The former South Boiler Room creates a new public realm that is unprecedented in ballet facilities. The volume and unique structure provides organization for a new lobby and circulation zones that are flooded in a mixture of daylight. In the uppermost landings, remnants of a former horizontal chase way inspired a new catwalk circulation corridor. The catwalk passes through a cloister-like experience in the base of former masonry chimney In the chimney base, a view upward leads to a new skylight enclosure at top, which also serves as relief air for the HVAC system. A mesh screen cylinder on the exterior, matches the original diameter of the chimney tower that was removed in the 1970s. Unique and prominent interior sloped steel structures, once simply 8 coalbunkers and 2 ash hoppers, now serve as children’s locker and dressing areas. At each coalbunker location, plate steel funnels now reign as frames for pendant light fixtures. And above all this, tucked quietly away a section of conveyor system that once transported ash and coal throughout the former power plant that has been adopted. 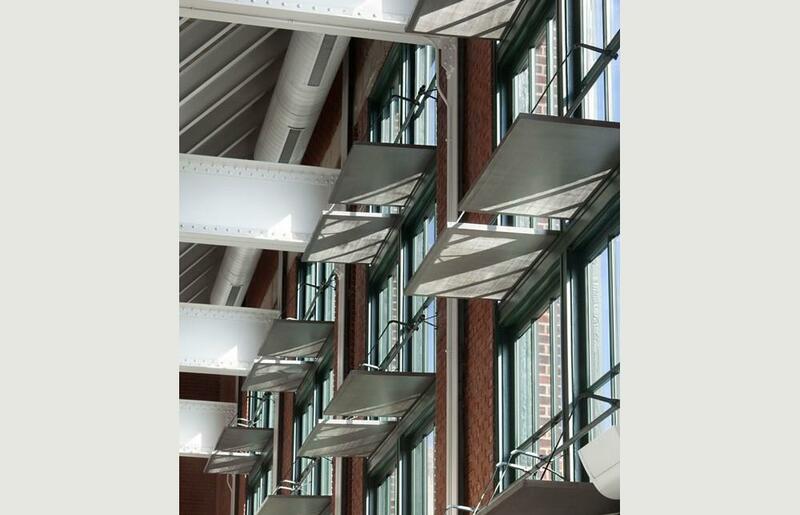 Even the pivot window hardware has been simply adopted to support new light shelves. Glass block infill marks the location of furnaces in the lobby, which now allows filtered daylight into the wardrobe workroom below. 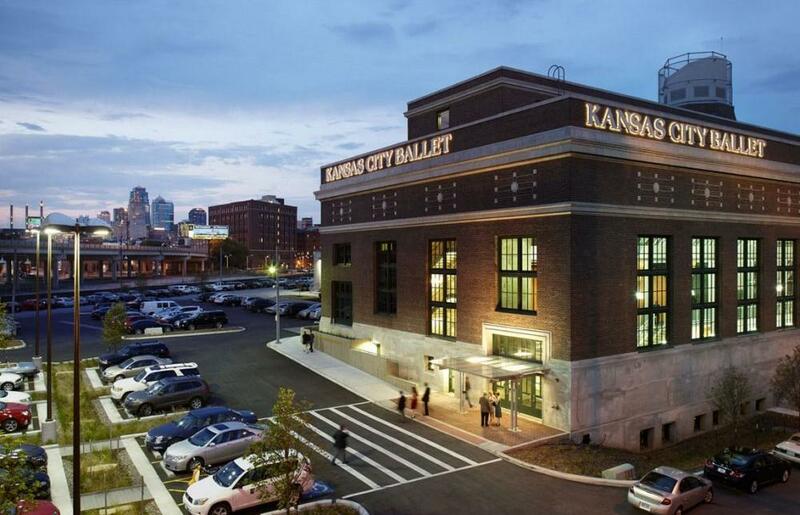 The Kansas City Ballet’s vision to be destination for dance culture is expanded much more than that y hearty community engagement and steadfast commitment to an urban location that required renewal and rejuvenation. This site completes Union Station’s restoration and rehabilitation of structures. The building meets their needs for growth. This reinvented building provides 52,000 square feet of space, seven state-of-the are studios, a physical therapy/training room, lockers and shower facilities for the company, office space for the company’s staff an archives. 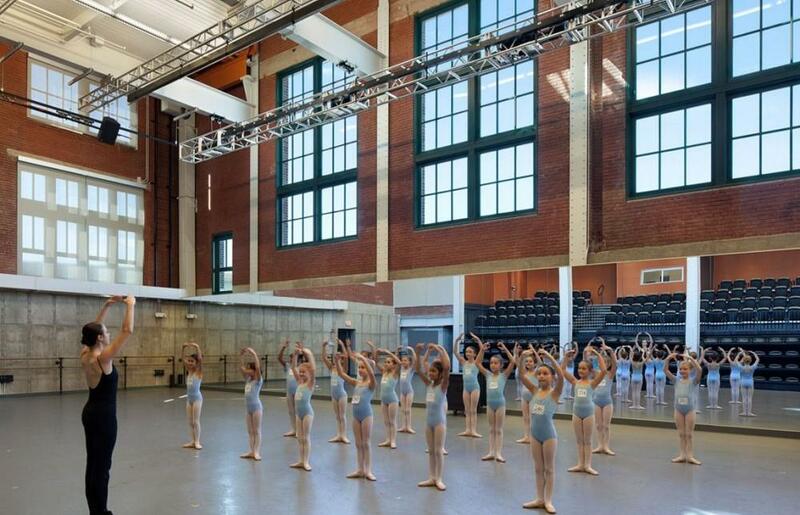 From day one, the Kansas Ballet filled the space with an artistic energy and a psychic lift in soaring daylit spaces. Voluminous studios are filled with classes of all ages as they create the next generation of dancers to enrich the Kansas City community.